Our Aim is to craft a range of premium wines that rank with the world’s best, while reflecting the soils of the small valley where Napier lies. In keeping with this philosophy all grapes are grown on the farm, hand tended, hand harvested, hand vinified. 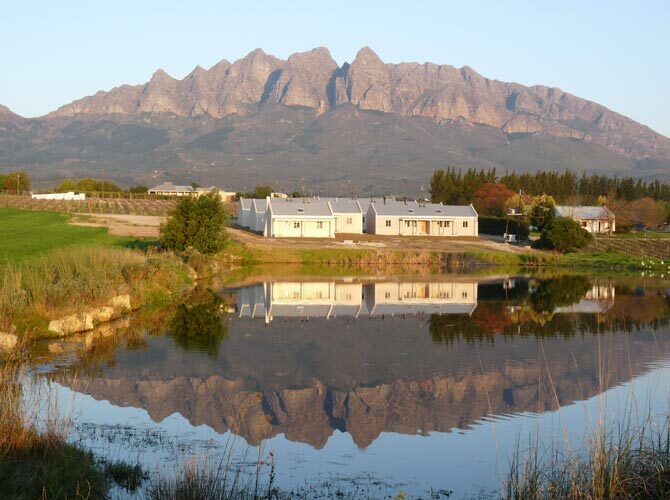 Napier Winery, set in a magnificent valley close to Wellington in the Western Cape, owes its name to Sir George Napier, Governor of the Cape of Good Hope from 1837 to 1843. It was Napier that christened the quaint rural town after the famous Duke of Wellington. Present owner, Michael Loubser, purchased the farm in 1989. Following the change in ownership the farm was upgraded, a modern winery was built, followed by a modern maturation and fermentation cellar. The new millennium added a brandy distillery, and alongside quality, handcrafted wines, now stands the Sir George potstill brandy. Napier Winery, under the careful eye of viticulturist, winemaker and estate manager, Leon Bester, strives to make premium wines (red and white) that rank with the best in the world, while reflecting the warmth of their African roots. Grapes are grown on the farm, picked and sorted by hand, and vinified with great care. Half of the 66 hectare farm is under vines. Seven dams provide plenty of irrigation water for the vineyards. Grape varieties include: Chenin Blanc, Chardonnay, Colombar, Cabernet Sauvignon, Cabernet Franc, Merlot, Malbec, Petit Verdot and Shiraz. Each wine produced, carries the symbol of a bead on its label. From earliest times, wine and beads have shared a long tradition in ritual, ceremony, trade and celebration. To reflect this tradition, Napier Winery chose the African bead as the emblem for its premium single vineyard block and each ‘Napier’ label thus displays a ‘single bead’. The commercial Lion Creek range on the other hand displays multiple beads on its label which signifies a blend of various wines from different blocks. The Sir George crest is used to signify their prestige ultra premium wine, Qintas and Potstill Brandy. The Sir George Qintas captures the essence of Quality, Inspiration, Nature, Terroir, Art and Science. The result is an ultra premium red wine made from the finest grapes and best barrels selected by our winemaker which will showcase the best of what Napier Winery has to offer. The brandy is closer in style to Armagnac. Dried apricots and pear flavours on the nose, sweet and soft mouthfeel with almost no burning sensation on the finish. Sublime. The Red Medallion is a premium Bordeaux blend consisting of the noble 5 varieties – the grapes have been carefully selected and nurtured by our winemaker. The wine has been matured in the cellar for two years in 300 liter French oak barrels and two years in the bottle prior to release. A superior red blend and has been quoted by the famous Bordeaux specialist Andrew Jefford as “The La Tour of the Cape”. A premium Cabernet Sauvignon made from a single block vineyard identified by our cellar master. The wine has been matured in the cellar for 1 year in French oak barrels. The Saint Catherine Chardonnay, made from a single vineyard identified by our winemaker. The wine has been matured in the cellar for one year in French oak barrels and one year in the bottle prior to release. A distinctive Greenstone Chenin Blanc made from a single vineyard identified by our winemaker. Low yielding 40 year old semi bush vine Chenin Blanc grapes are used in this premium product. The Lion Creek Cabernet Sauvignon is an easy drinking Cabernet Sauvignon that matured one year in a combination of barrel and oak staves – a well structured and accessible wine. The Lion Creek Cabernet Sauvignon Shiraz is a fruity easy drinking red blend the wine has been matured in a combination of 2nd and 3rd fill barrels and oak staves. The Lion Creek Chenin Blanc Sauvignon Blanc is a fresh white wine for all occasions and seasons.